Using several different social networks can get confusing. Threadsy aggregates a bunch of them in a Web app, and mostly manages to make it compelling. It’s basically a one-stop shop for online communication. Threadsy has been available in a private beta for a little while now, but today opened the service to the public. I hadn’t used the beta, so this public release is my first exposure to Threadsy, and honestly, I’m a lot more impressed than I expected. That doesn’t mean I’m going to use it, though. 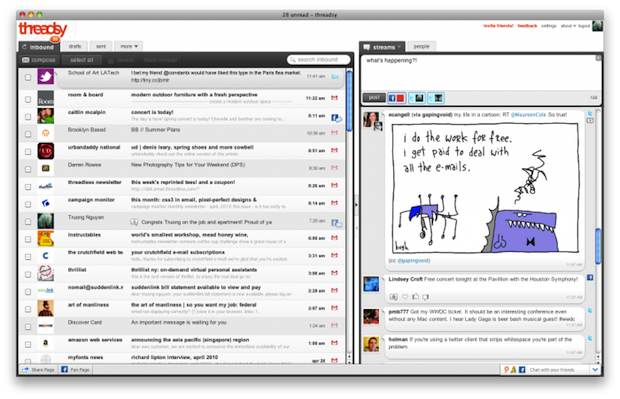 There’ve been social networking aggregators before–FriendFeed comes to mind–but Threadsy is the best one I’ve seen yet. Instead of one Twitter-like stream a la FriendFeed, Threadsy smartly separates messages from live updates. On the left, you’ve got messages, including email (Gmail is supported handily, and it looks like it can handle most email services), Facebook messages, and Twitter direct messages. On the right are your feeds–so far, only Facebook and Twitter are supported, but those are the two biggies (and, if I’m being honest/selfish, the only two I use). The Facebook and Twitter stream section is handled really well–updating to either or both is easy, the interface is clean and obvious, and combining those two just makes sense. You can’t seem to upload photos, which is a problem; you want an aggregator to be able to handle absolutely everything a standalone app could, otherwise you’ll keep bouncing back and forth between the aggregator and the standalone and eventually, necessarily, stop using the aggregator. One really cool feature: If you click on a message in the left-hand column, you’ll see a complete overview of the sender in the right-hand column. Open an email from a friend, and you’ll see his photos, links to his Facebook and Twitter, and all his recent updates. But overall, email isn’t amazing. It’s a pretty good client, don’t get me wrong, and I like how it integrates Facebook messages into the messages, along with email (because I have a tendency to completely ignore Facebook and thus Facebook messages), but for those of us who use email extensively, Threadsy just can’t stack up to Gmail. I miss the keyboard shortcuts, the speed, the file previews, and the interplay between Gmail and Google Apps (Reader, Maps, Documents, Calendar, Picasa). Even worse, you can’t upload or send files of any kind, including photos and documents. Threadsy is a good idea, and it’s got promise. But it’s not going to succeed unless it can offer everything a standalone app can (which is going to be a hell of a challenge in the case of Gmail). Really, this kind of concept works better in the limited space and limited power of a smartphone, like Larva Labs’ excellent Slidescreen app for Android, HTC Sense UI’s FriendStream, and the home screen of Microsoft‘s upcoming Windows Phone 7 OS. Maybe if you’re a very rudimentary email user (and I mean very–remember, you can’t even email photos) yet a voracious social networking user, Threadsy would work. And for those in that category, it’s pretty great. But I’m going to stick with separate apps for now.